Generally it is said that Methi Dal makes a perfect summer meal as during a heat stroke .Dal with fenugreek leaves is a very simple and delicious dal based dish made with masoor dal and fresh fenugreek leaves cooked together with Indian spices. 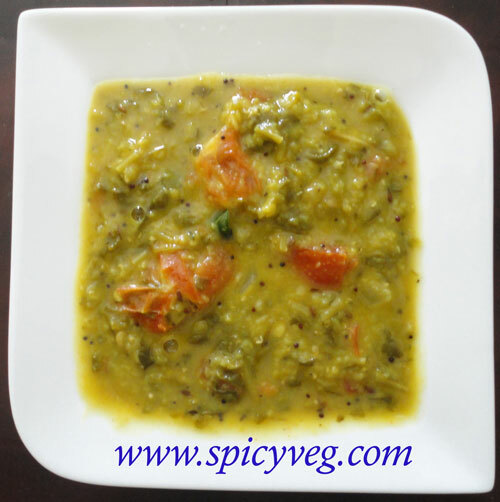 This dish is commonly known as Methi Dal in North India. It is a very nutritious dal recipe with subtle flavours from the garlic and spiciness from the crushed dry red chillies. Fresh fenugreek leaves or methi leaves have a delicate and aromatic smell that release a wonderful smell on cooking with masoor dal. Fenugreek is a popular green leafy vegetable that look naively mild but when cooked, dazzles and grabs the attention of each one with its amazing aroma if cooked with dal. Dal with fresh fenugreek leaves is a fantastic combination very popular in the Andhra region and North India. The dish is very simple and fast to prepare with very minimal ingredients making it rustic dish and is neither having a runny nor dry consistency. It goes exceptionally well with roti, chapatti, bhakris or even plain cooked rice. The simplicity of the mild and subtle flavours of the tadka with little few strong ingredients like the garlic, dry red chillies, asafetida, mustard seeds, coriander leaves enhances the flavours of this dal. Dal is a staple dish accompanied with any flat Indian breads or rice throughout India. Dal with fenugreek leaves mainly gets its flavours from each and every ingredient that is added in without dominating each other. On the whole, this dish is power packed with all the nutrients and vitamins received from lentils, fresh fenugreek leaves, garlic, asafoetida (hing) etc making it healthy and nutritious to eat. In Indian, fenugreek leaves are known to have cooling effects and is extensively used during the summer months in the northern & north western part of India, as food & part of kitchen medicine. These tiny legumes excellently provide protein and iron from a non-meat source, thereby providing energy without animal fats. 1.The leaves of fenugreek are made into a paste and applied on the body and one clove a day will improve your health and 2-3 cloves will help prevent a cold. 2.Lentils are often mixed with grains such as rice which results in a complete protein dish. They also contain dietary fibre, folate, vitamin B1 and having a good source of iron. 3. Chop onion and tomato . Crush garlic cloves. 4. Heat a deep pan. Put 1 tbsp oil into it. Once the oil is hot, add mustard seeds. When mustard seeds crackle, add asafoetida, red chilies and garlic cloves. Add chopped onions and fry them till translucent.Then add chopped tomatoes.Allow it to cook for some time. 6. Add salt and red chilli powder and simmer for 10 minutes. 8.Serve hot with chapati or rice.